Show him the electric clipper and let him sniff it while it is turned off. Turn it on so the pet can get used to the sound. Have the pet sit while the tools are running. Once he is used to the tool, try touching it to his hair.Otherwise repeat the above steps a few times. If pets have long and thick hair, use scissors cut part of them at first, otherwise the clippers will jam up and don't work properly. To extend the blade life, we suggest you clean pets' hair before hair trimming. Please do not disassemble the clippers by yourself. This product can only be allowed to clean slightly wet cloth. Due to shipping restrictions, your package does not include lube oil. 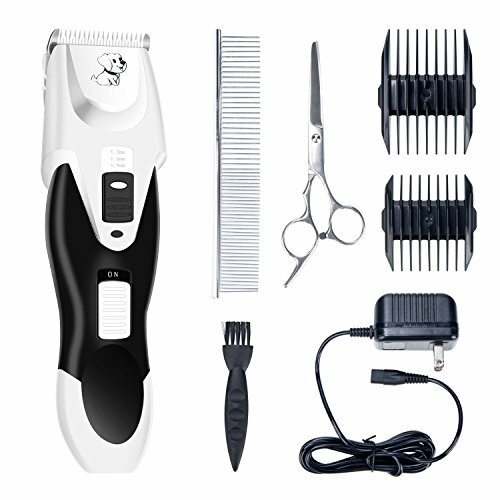 Pet clippers for dogs with Precision motor, low vibration and ultra quiet design, free it from work noise with only about 60 db, to help the pet feel at ease, not afraid haircut any more. Powerful motor of professional dog clippers (the spindle of which is made of fine copper), not to clamp and hurt pet hair. Pet clippers with Titanium acute-angle blade combining with the ceramic movable blade for smooth and efficient cutting,the fine-tuning knob offers five level of length (1.0-1.3mm)for precise adjustment on hair length.With 2 attachment guide combs: thinning-out, (3mm/6mm/9mm/12mm,) skin-friendly contour-following combs make it safe, easy, comfortable. Powerful Motors & No Clogged: 3.7V, 15W motor power. Up to 9,000 revolutions per minute, providing amazing power without hair clogged.30 Teeth Sharp Blade: Compared to other 24 teeth of the blade, our 30 teeth sharp blade is the best for hairy, thick or soft hair dogs, cats or rabbits. If you have any questions about this product by DCCompras, contact us by completing and submitting the form below. If you are looking for a specif part number, please include it with your message.